Ryder Cup winning golfer Philip Price has received an outstanding achievement award from the Golf Union of Wales. 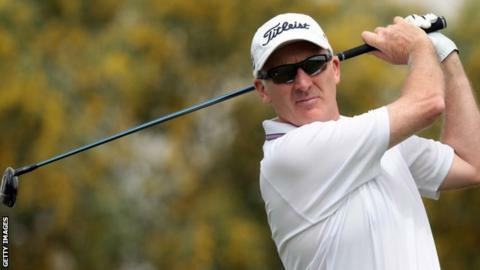 The Pontypridd-born golfer won three tournaments on the European Tour but is best remembered for being part of Europe's 2002 Ryder Cup winning team. Pric, 49, famously beat American Phil Mickelson, then ranked second in the world, at the Belfry. "It's been great doing something you love," Price told BBC Wales Sport after receiving his award. "It's nice to be recognised. Hopefully there's a lot more gold to come." The three victories on the European Tour came at the Portuguese Open in 1994, the Algarve Open de Portugal in 2001 and the Smurfit European Open in 2003. His best placing at a major was a T10 spot at The Open Championship when it was held at Royal St George's in Sandwich 2003. Amy Boulden won the Golf Union of Wales pro of the year award. The 22-year-old from Llandudno recorded three top 10 finishes from 16 starts on the Ladies European tour in 2015.